Welcome to a brand new week lovely pinners. Hope you all had a fab weekend. This week I am happy to be hosting another monday #pinitparty. Please come join us this week and link up any family/parenting/craft/recipe posts you might want to share. They don’t even need to be recent. Perhaps show some old classic posts some love. As host I get to choose two of my favourites from last week’s entries to feature. With Halloween approaching I could not resist my two featured picks. Second, these adorable popsicle monsters from I heart arts ‘n’ crafts. How brilliant are they? Huge thanks to our two featured pinners and feel free to grab yourself a badge! Really, anything you like. The more variety the better and there is sure to be something for everyone. 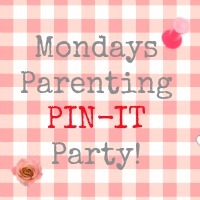 Each entry will then be pinned by the host to the Monday Parenting Pin-It Party board on Pinterest, see below. 2. 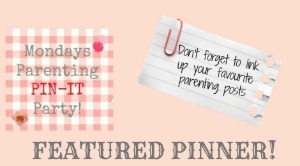 Follow the Monday Parenting Pin-It Party board on pinterest, featured below. Follow jbmumofone’s board Mondays Parenting Pin-It Party! on Pinterest. Follow jbmumofone’s board Mondays Parenting Pin-It Party! on Pinterest. 3. Try to visit two other entries on the list that you like the look of and may wish to pin to one of your own boards, and leave them a comment letting them know you came from here and leave your pinterest ID. 4. For those Pin-It Party members that comment on your post, try to visit on pinterest and follow at least one of their boards. This way everyone should hopefully gain some new followers themselves whilst discovering lots more cool stuff to pin and like-minded pinners to follow. It is all about sharing the pin-tastic-love people! It would also be super lovely if you would like to link your post back to the host by either a text-link or by grabbing the badge but you are under no obligation to do so. If you would like us to e-mail you with a reminder when the Pin it Party goes live each week simply add your e-mail to the form below. We promise not to e-mail you about anything else though, ever! So without further ado, let’s get this party started!